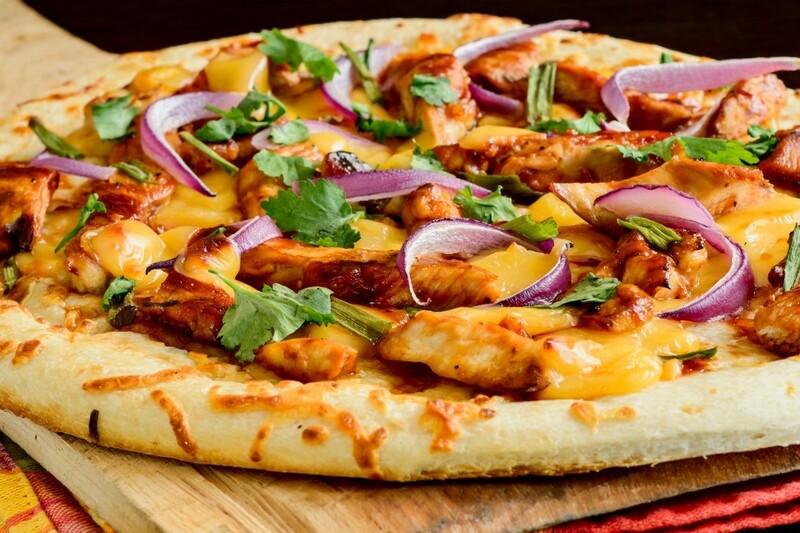 BBQ chicken pizza is a great choice for making at home. This page contains BBQ chicken pizza recipes. Easy, yeastless homemade dough combined with fresh cut veggies and lean protein = a meal healthy enough to keep those healthy eating resolutions, but yummy enough for football nosh! For the dough, mix dry ingredients in a large bowl. Add in water (warm) and oil. Mix until soft, let set on a warm surface for two hours (it won't rise, but I find it more malleable if it sets for awhile). Roll out onto a floured countertop. Saute the chicken breast in the olive oil until browned. Add in garlic, kale and onion (diced). Cook until tender. While they are cooling, prep your sauce by mixing BBQ sauce and sour cream, add garlic salt. Add 1 tbsp. oil to crust and bake crust at 400 degrees F for 5 minutes. Spread BBQ/sour cream sauce on crust. Sprinkle with mozzarella. Chop up your tomato and basil, spread over cheese. 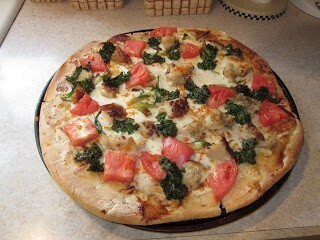 Chop up the chicken, sprinkle, along with remaining veggies, onto crust. Bake at 400 degrees for 15 minutes, broil for 2 minutes. Mix dough as normal or per package directions. Cut chicken into cubes and marinate in 1/2 cup barbecue sauce in refrigerator for 30 minutes. Preheat oven to 350 degrees F. Heat olive oil in frying pan. Saute chicken for 3-5 minutes until done. Spread dough in pan. 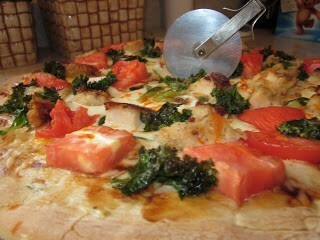 Spread 1/2 cup barbecue sauce over crust. Sprinkle 1/2 cup mozzarella cheese and all of the Gouda cheese over sauce. Add chicken and onion. Sprinkle on remaining mozzarella cheese. Cilantro goes on top. Bake 25-30 minutes.